Very rarely does claiming a workers’ compensation benefits go smoothly. With a financial incentive to pay you as little as possible, insurance companies will often do everything possible to challenge your claim, reduce payment obligations, delay your case, or implement other tactics to avoid the obligation to make a sizable payout. Hiring an experienced and knowledgeable workers’ compensation attorney can provide a number of benefits. First, a primary objective of a workers’ comp attorney is to serve as your biggest advocate. This means fighting insurance companies to provide proper medical care and making sure they continue to fulfill their obligation to pay your weekly benefit checks. Additionally, should you choose to settle your case, your attorney will work with the insurance companies to negotiate an appropriate and fair settlement. Next, upon hiring an attorney and providing him or her with all necessary medical history and documentation, you lawyer will be able to evaluate your claim. He or she can assess the strengths and weaknesses of your case and provide a calculation for how much your case is worth. By combining your past and current medical costs with future medical care projections, your attorney can take all of these factors into consideration to fight for a settlement that will maximize your workers’ compensation benefits and the value of your case. 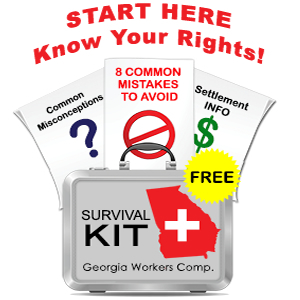 Third, you lawyer will interpret and explain the Georgia workers’ compensation insurance laws and how to avoid potential problems that may weaken your case. Fighting your employer insurer for fair workers’ compensation benefits is not a simple feat nor is it something you should do alone. If you have been injured on the job in the state of Georgia and are pursuing a workers’ compensation claim, please call our office as soon as possible.